This is the time of year when people start making to-do lists. Perhaps you’re one of those people who always makes to-do lists and relishes the feeling that comes with checking off each item. But to be successful and less stressed in our day-to-day lives, we also need a TO-DON’T list. What Is a TO-DON’T List? 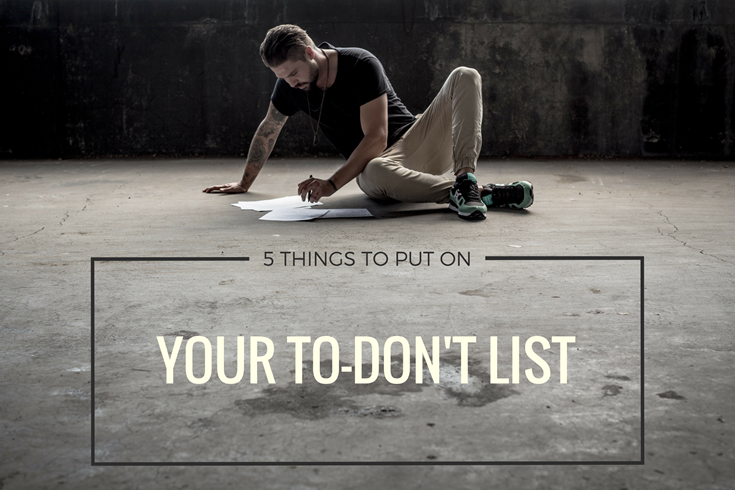 A TO-DON’T list has on it those things we shouldn’t waste our time and energy doing. It’s probably the harder of the two types of lists to follow since most items are ones we have to remember time and time again not to do. We can’t just not do it once and check it off. We have to refer back to it, remember it, and develop it as a habit. That can also take a lot of energy. But, if you spend your energy working on your TO-DON’T list, you’ll save more energy in the long-run. Below is an example of a TO-DON’T list. It’s my own personal TO-DON’T list for 2017. Feel free to copy it, add to it, or tweak it any way you need to so you can de-stress and focus your energies on what’s more important in life. Apologize when I’ve done nothing wrong. Say “that’s okay” when someone apologizes to me. Instead say, “I accept your apology.” Think about the difference between the two. Saying, “That’s okay,” is giving people permission to repeat the offense. Saying, “I accept your apology,” shows forgiveness and at the same time sets a healthy boundary. Just say “I’m sorry” when I apologize to someone. Instead add to that, “How can I make it right?” and try to do so. Otherwise, my apology is insincere and has no action behind it. Censor myself too much on my blog. I want to be more transparent so others can learn from my experiences instead of worrying they will think I’m talking too much about myself. Do anything that doesn’t support or line up with my personal mission statement. Do you have a personal mission statement? If not, add that to your to-do list! It can serve as the basis for helping make difficult choices easier to decide. I’ll teach you how in to come up with your own mission statement in my coaching services and soon-to-be-released on-demand programs. What should you add to your own TO-DON’T list? Perhaps you don’t need to continue feeling stuck in your current job. Maybe you don’t need to keep putting off pursuing your passions or letting lack of confidence stand in your way. Or, you don’t need to put off any longer getting help in these areas. If this is the case for you, add to your to-do list, “Fill out the paNASH intake form.” It’s a simple item you can check off your list to get you started on a brighter future! Check out my on-demand program 5 Ways to Pursue Your Passions in Life & Work. Originally published at www.yourpassioninlife.com on January 11, 2017.